Why just Bourbon & Bacon when you can Bourbon & Bacon in style? Enjoy 15 tastes of food and 15 sips of your favorite spirits, as well as an extra hour and a half of tasting time before general admission doors open. Get a Bourbon & Bacon Fest bag, as well as a commemorative tasting glass. Enjoy an ample two and a half hours to sample a myriad of bourbon and bacon treats! Take home a special commemorative tasting glass. 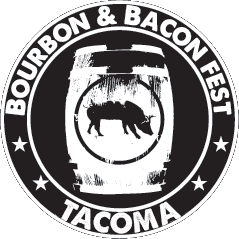 Be a hero at Bourbon & Bacon Fest. Get your friends safety to and from the Tacoma Armory with our food-only ticket option (complimentary non-alcoholic drinks provided). If you arrive after general admission doors open (7pm), you can skip the line with a special VIP entrance line. You’ll get 10 food tasting tokens. All tickets are subject to service and/or processing fees. Additional food and drink tokens will be available for purchase at the event. Must be 21+ with valid photo ID to attend. Please enjoy Bourbon & Bacon Fest Responsibly.